The Mural Arts Program of Philadelphia began in 1984 as a summer youth program with modest support from city government. Under the guidance of Jane Golden, however, it gradually grew into one of the largest and most successful public art organizations in the country, garnering support from local corporations, foundations, and individuals to extend the reach and effectiveness of its innovative programs. 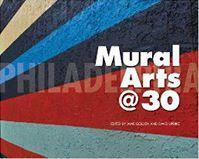 Philadelphia Mural Arts @ 30 traces the program's history and evolution, acknowledging the challenges and rewards of growth and change while maintaining a core commitment to social, personal, and community transformation. Contributors include: Dr. Arthur C. Evans, Jr., Arlene Goldbard, Thora Jacobson, Rick Lowe, Dr. Samantha L. Matlin, Paulette Moore, Jeremy Nowak, Maureen H. O'Connell, Elisabeth Perez Luna, Robin Rice, Dr. Jacob Kraemer Tebes, Elizabeth Thomas, Cynthia Weiss, Howard Zehr, and the editors.